We lost one of our own today. A pioneer and himself a fanboy. 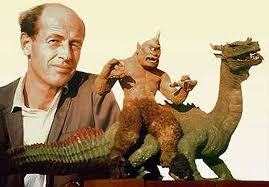 Ray Harryhausen, world class stop motion animator died today at the age of 92. I’m not going to go into all the wiki of Ray’s life. It’s all there if you want to look up the who’s, when’s and how’s of his life and I encourage you to do so. Instead, I’m just going to tell you what he meant to me. As an impressionable young weirdo, nothing was more interesting or important to me than monsters. Especially big, giant marauding beasts and dinosaurs. And like many of you, I spent many a Saturday afternoon in front of the TV watching old monster movies. The man who made the best monsters for those movies was Ray Harryhausen. I saw the “Sinbad” movies he worked on as well as “Octopus” and “20 Million Miles to Earth” but it was “The Valley of Gwanji”, a movie that combined two things I loved–cowboys and dinosaurs–that really fired my imagination and kept me grinning from ear to ear. I didn’t need great acting or even much of a story, so long as a movie had monsters that convinced me and Ray’s always did. In fact, I can go from watching “Jurassic Park” and “Lord of the Rings” to watching “Valley of Gwanji” and Ray’s monsters still convince me. Many of you are familiar with stop motion animation, I’m sure, but for those who might not be I want to give you an idea of what he did. In a typical movie there are between 24 and 30 Frames for every second of film shot. That’s at least 24 little adjustments Ray Harryhausen had to make just to create one second of action. Now think about something like the scene from “One Million B.C.” where the pteranodon is trying to feed the lady to its babies. There were probably three wing flaps per second…that’s 72 adjustments for just a couple of wing flaps that had to be set up and shot. Think about how frustrated you get when you type a few paragraphs, forget to save them and then lose them. Now imagine what it must’ve been like to lose, as Harryhausen inevitably did, a few minutes of film here or there. It would’ve consisted of weeks worth of painstaking work. That’s how you know he loved his job. It required an amazing amount of patience, endurance and precision in addition to outrageous imagination and profound insight into movement, anatomy and life. Ray Harryhausen got into animation because he was a childhood fan of the work on “King Kong.” Just like many of us who choose creative livelihoods, he was also a massive fan, inspired by the work of others. He had many imitators but no one could breathe magic into those stop motion models the way he did. Every eye roll, facial expression…the fluidity of a tail twitch or the way a monster twiddled its fingers…that’s where his genius lay. He always made a believer out of me and he still does. Below is a four minute compilation of every (so it says) creature that Harryhausen ever animated for film. Give it a watch and see if he doesn’t make a believer out of you too. You will be missed Ray. Sleep well. R.k.Kombrinck is a writer and artist who lives in Cincinnati, Ohio with his wife and two sons. He is a founding cast-member of the popular horror podcast “Night of the Living Podcast.” He enjoys iced-tea (unsweet) and genuinely believes in Sasquatch. That’s another architect of my childhood gone. So many magical days spent watching the Sinbads, Clash of the Titans et al as a kid, kickstarting my love of movie monsters. Thanks for the memories Mr. Harryhausen. We lost a truly great man and visionary today. I just watched ‘Ray Harryhausen: Special Effects Titan two nights ago and was amazed at how he was an amazing artist. When I was a little girl I was obsessed with Clash of the Titans, it scared and entranced me all the same time. Voodoo work Kelley!